M40 west to junction 10. Join A43 (Northampton) to join M1 northbound at junction 15A. Exit the M1 at junction 33 and take third exit from roundabout (signposted A630 Rotherham). Continue on A630 over three roundabouts, then at the fourth (Masborough Roundabout) take the third exit onto Main Street. The stadium is located down Don Street, which is a right turn after the Council Offices. However, please note that there is no parking for away fans at the stadium. Check www.rac.co.uk for specific or more detailed directions. Train: Nearest station is Rotherham, just under one mile from the stadium. Connections from London to Sheffield/Rotherham are via St Pancras or alternatively from Kings Cross via Doncaster. Connections from High Wycombe via Birmingham are also possible but allow at least four hours total travelling time from High Wycombe. Look out for special offers on the service from St Pancras. Check www.nationalrail.co.uk for specific times and connections. Guy Branston - Defender who played on loan at Wycombe from Rotherham United during the 2003/4 season - making 9 League appearances under Lawrie Sanchez. Made four loan appearances at Northampton Town during November and December 2007 while on the books of Peterborough United. The former Leicester City trainee in the late 1990's, has a host of other Football League clubs under his CV before moving into non-League football with Kettering Town in February 2008. Spent time at Burton Albion at the start of their promotion season of 2009/10 before moving on loan to Torquay United in the January 2010 transfer window and made the move permanent in the summer of 2010. Drewe Broughton - Travelled striker who had a brief loan spell at Wycombe during the 2004/5 season while he was at Southend United. Joined Rotherham at the start of the 2008/9 season following spells with Rushden & Diamonds, Chester City, Boston United (loan), MK Dons and Wrexham. Originally a trainee at Norwich City, he made his biggest impact during two and half years at Kidderminster Harriers where he bagged 20 goals in just over 100 games. His early career also saw spells with Brentford and Peterborough United. Tony Cunnigham - Played for 11 Football League club's, starting his career with Lincoln City in 1979 and ending his career with Wycombe in the 1993/94 season. Moved from Lincoln to Barnsley in 1981 and went on to play for Sheffield Wednesday, Man City, Newcastle United, Blackpool, Bury, Bolton and Rotherham (between 1991 and 1993 - scoring 24 League goals in 69 apps). Also played for Doncaster before his move to Wycombe where he made just five appearances before moving into non-League football with Gainsborough Trinity. Delroy Facey - Striker who made six Football League appearances for the Wanderers during the 2007/8 season while on loan from Gillingham. Switched to Notts County in the summer of 2008 after his contract was terminated by The Gills. Originally a trainee with Huddersfield Town. Signed by Sam Allardyce at Bolton in July 2002 and played in ten Premiership games before loan spells with Bradford City and Burnley. Moved to West Brom in January 2004 and then to Hull City in the summer of 2004 where he played under Wanderers Manager to be Peter Taylor. Went on to have short spells with Oldham Athletic, Tranmere Rovers and and spent the 2006/7 season at Rotherham United before his move to Gillingham in July 2007. Mark Foran - played on loan for both clubs while he was at Sheffied United - making three appearances for the Millers during 1994/95 and seven apps for The Chairboys in 1995/96. Went on to play for Peterborough United, Crewe Alexandra and Bristol Rovers. Moved to Telford United and then Northwich Victoria in the latter part of his career. Andy Turner - Had a short loan spell at Wycombe in August 1994 while on the books of Tottenham Hotspur. Eventually joined Portsmouth and then Crystal Palace before moving on a free to Rotherham at the start of the 1999/2000 season. Made 36 League appearances, scoring once before moving to Yeovil Town in the summer of 2001. Has since played for Tamworth, Northampton Town, Northwich Victoria and Moor Green before retiring from the playing side. Tony Cunningham - Jamaican born striker who spent a couple of months with Wycombe at the end of the 1993/94 season - making five League appearances. Began his professional career with Lincoln City in 1979 - scoring 32 goals in 123 League appearances before an �80,000 moved to Barnsley in 1981. Went on to play for Sheffield Wednesday, Man City, Newcastle United, Blackpool, Bury and Bolton. Joined Rotherham in 1991 and scored 24 goals in 69 appearances during a two year spell. Also spent time at Doncaster Rovers before his move to Wycombe. Reuben Reid - Striker who joined Rotherham in the summer of 2008 from Plymouth Arygle. Played on loan for Wycombe during the 2007/8 season on loan from Plymouth, making 11 League appearances but just one start - scored his only goal on his Wycombe debut during the 2-1 victory at Maccslesfield in September 2007. Also spent time on loan to Kidderminster Harriers, Rochdale, Torquay United and Brentford while at Plymouth. Alex Revell - Striker who made 15 League apps and scored 6 times for Wycombe after joining on an 'emergency loan' from Southend United in January 2010. The former Cambridge United youth player has also seen service with Brighton, Swindon (also on loan from Southend) and then Leyton Orient after turning down a permanent move to Wycombe in the summer of 2010. Signed for The Millers in the summer of 2011 and scored 10 League goals in 40 apps during his first season. Sam Wood - Midfielder who played on loan for The Millers during the 2011/12 season while on the books of Brentford, making 26 League apps and scoring once. Joined Wanderers in the summer of 2012 on a free from The Bees where he had made close to 200 apps in a four year period. Originally started his senior playing career with Cray Wanderers and Bromley. 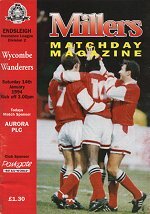 Wycombe first met Rotherham in January 1995 for a Division Two meeting at Millmoor. A dismal day for fourth placed Wycombe ended with a 2-0 defeat. Andy Hayward scored for the home side after eight minutes with an own goal from Steve Brown completing the bad day out. In the side that day for The Millers was Shaun Goater before his subsequent moves to Bristol City and then Man City. Dave Carroll and Keith Ryan were in the Wycombe side that day.